@Cozmacozmy We shared the list, we didn’t choose or endorse it. Next, the Girl Scouts issued a rather half-hearted apology for the tweet about Davis after the discovery of the Scouts’ seeming endorsement of the abortion advocate caused a protest among Girl Scouts members, parents, and the public at large. Media Matters also claims it is a “myth” that the Girl Scouts is affiliated with Planned Parenthood. 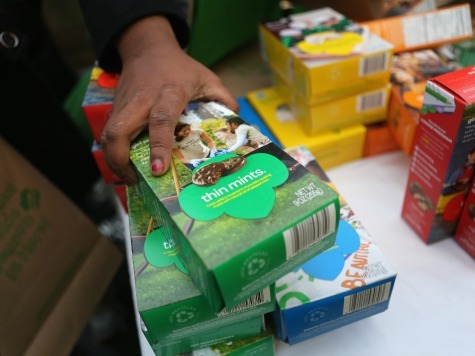 Media Matters also claims it is a “myth” that the Girl Scouts promotes left-leaning politics. Instead, the outlet states the girls’ organization has connections to both political parties. Aside from the fact that Media Matters presumes there are no “left-leaning” Republicans, the associations the Girl Scouts have with the abortion industry and the culture of sexual promiscuity are primarily at issue. Pisciotta said his group did not single out the Wendy Davis tweet because Davis is a Democrat but because she represents the pro-abortion culture. “We simply stated that they have in their tweet about Wendy Davis advanced her as role model for girls,” said Pisciotta. Christy Volanski, former Girl Scout mother and now leader of opposition against the organization, spoke to Breitbart News’ Ruse regarding current Girl Scout CEO Anna Maria Chavez, who took to YouTube last week to deny charges from cookie boycotters.